Over the past 12 months, London-based audio and lighting equipment supply and rental business Podd Sound has increasingly turned to a QSC WideLine-8 line array for sound reinforcement at the PAs, live webcasts, launch parties and live performances that form a major part of its business. Since last year, founder Mat Pod has worked for some of the hottest names in Londons music industry, including Daft Punk, Little Mix and Olly Murs, providing sound reinforcement on smaller, intimate stages or in meeting rooms on record company premises rather than at traditional concert venues. Some of the bigger names to benefit from the WideLine-8 system recently have been Pharrell Williams and Michael Jackson, whose posthumous album Xscape was given its European media debut via the WideLine-8 system on March 31st. The first such high-profile event covered by Podd Sound was Sony Music Europes launch last summer of Daft Punks smash album Random Access Memories, which took place at Londons tallest building, The Shard. For the evening event, Mat Podd chose a WideLine-8 array comprising 16 QSC WL3082 line array elements and 12 WL212-sw subwoofers, arranged in four stacks, driven by no fewer than nine QSC PL380 amplifiers, and managed by two SC28 processor/system controllers. The Shard was an impressive-looking venue, but of course the room chosen for the event was a strange shape, and all of the hard glass surfaces made rigging the PA a challenge, explains Mat Podd. Ive been a fan of QSC loudspeakers for a few years and thought the wide dispersion of the WideLine system would help me achieve the coverage that was required. The QSC distributor here, Shure Distribution UK, was very helpful, and the system worked really well. WideLine is so compact, it was ideal for use in the Shard, where we didnt want the speakers spoiling the view, and its also good for loading in and out of venues. I handle a lot of London-based events, and in this day and age, you want the gear to be as light to move as possible you cant really drive huge rigs around in the city in 7.5-ton trucks any more. The ratio of size to weight and power output is really impressive, too. 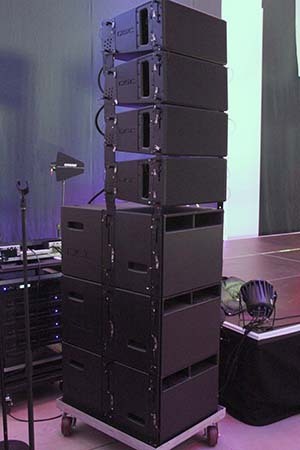 The Podd Sound WideLine-8 has also been used as a straightforward PA, arranged in two stacks, at live events for Little Mix and Olly Murs in recent months. At the Olly Murs gig, a combined live gig and webcast at Sony Musics Kensington HQ, Podd added extra subs to the stacks to add height and project the sound across the audience. You get excellent dispersion from WideLine, he comments, so Ive found I dont need side-fills in these smaller venues. The Michael Jackson Xscape launch required a different approach again. Held in the main ballroom at the stylish five-star Bulgari Hotel in Knightsbridge, London, the exclusive album playback required a high-quality sound system, both in terms of its reproduction and its physical appearance. I was asked to use ground stacks in the hotel ballroom, continues Pod, but this time the media were all due to be seated, so I had to make sure that the dispersion was right, and that the music didnt disappear over their heads. Fortunately, the WL212-sw subs have a mounting provision in their suspension system that allows WideLine 3082 units mounted on top of the subs to be angled at up to 10 degrees downwards, even when the subs are ground-stacked. It was almost as though the array was hung, explains Mat Pod, so during the playback, the music was aimed right at the seated audience. The final system used at the Jackson launch comprised four ground stacks, each comprising three WL212-sw subwoofers, with four WL3082 full-range WideLine units on top. Amplification was provided by a total of eight QSC PowerLight PL380 and two PL325s. All in all, the QSC WideLine-8 has been great for producing a detailed sound that doesnt overpower the smaller rooms Ive been working in lately. They dont weigh much, are only 50cm wide, and have got the fastest rigging and flying systems, concludes Mat Pod. For me its one of the best compact line arrays out there.